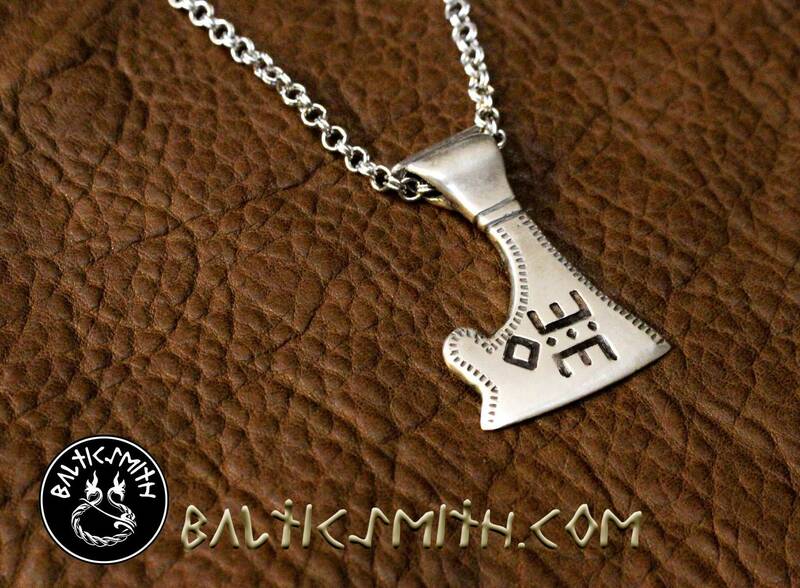 Viking Age axe charm, commonly called "Axe of Perun". Such charms, also known as votive axes, were more common in Baltic, Slavic and Finnic lands, the Type I ("bearded") votive ax being concentrated mostly along the Daugava River in Latvia. Send me a drawing, and I will stamp or engrave it for you as a recessed ornament on the silver or bronze axe charm. These prices are valid if I am able to replicate your drawing with existing tools. If your design requires me to make new tools, the cost will need to be negotiated. They were contemporaneous with the better-known Thor's hammers of the Norse. Given the popularity of both ax and hammer charms soon after contact with Christianity, it is possible that they were worn as an affirmation of indigenous Heathen/Pagan faith in the face of sometimes violent Christian intrusions. The Slavic Perun (Перун), Baltic Pērkons/Perkūnas, Finnish Ukko/Perkele and Norse Thor (Þórr) were powerful male gods of thunder and lightning. The next time you hear firewood being split or a blacksmith hammering on an anvil, close your eyes and imagine thunder. Which is more similar? Approximate size and weight (I will select the most appropriate blank based on your design): 53 x 40mm (2 1/16 x 1⅝"), 20g. Finished on both sides. Being handmade, these axes may vary slightly in size or weight. I offer numerous chain and leather lace options, but they are in addition to the listed price. Price is for pendant only.